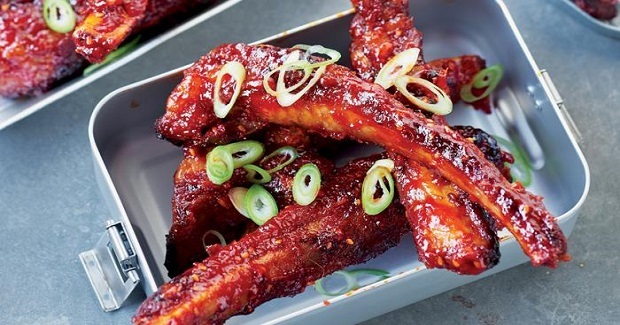 Sticky, Spicy Pork Ribs Recipe - Gutom Na! Posted on Friday, July 29th, 2016 at 5:42 pm. Put the ribs in a large saucepan or stockpot with the ginger, garlic, soy sauce, and enough water to cover. Bring to a boil, reduce the heat to a simmer, and let cook gently for 1½ hours, until the ribs are tender and cooked through. Meanwhile, combine all the sauce ingredients in a bowl and mix together well. Line a roasting pan with foil (this will make everything a lot easier to clean up later) and preheat the oven to 400°F. oven for 20 minutes, turning and basting the ribs with more sauce halfway through cooking. Remove the pan from the oven and put the broiler on high. Brush the ribs once again with the remaining sauce, then broil for 2 to 3 minutes, or until the sauce is sticky and just beginning to char at the edges. Scatter with the scallions and serve.